Obviously, this is a project for an advanced electronic hobbyist and computer enthusiast. The computer is supplied with the 'ANONYMOUS' BIOS operating system and 64K of memory. We also have added IC sockets for all chips, knowing this is a huge hobbyist advantage, despite the additional cost. You will need to provide all the other parts to create a working computer system, such as power supply, keyboard and video output card/monitor. There exists an unbelievable amount of software, diagnostics, documentation and hardware to support this board. After all... it is, for all intents and purposes, completely compatible with the original IBM PC. Please note: This is an advanced electronic kit requiring careful assembly, which includes fine soldering, good attention to detail and knowledge of computers. Your project will need to be self-directed. Building a computer is an advanced electronic project. We are not able to offer returns on kits after construction has started. PC-RETRO MOTHERBOARD COMPUTER KIT (Catalog #PC-RETRO)...$197.50, Free USA Shipping, International Customers see below. BY PAYPAL: click the "PAYPAL, Buy Now" button. International & Mail Orders: See details below. The PC-RETRO MEMORY BANK OPTION (Catalog #MEMORY) is an optional item which will expand the onboard memory of the PC-RETRO by another 64 KB. The memory of the PC-RETRO is measured in 'BANKS' of 64 KB each, in exactly the same way as the original IBM PC. 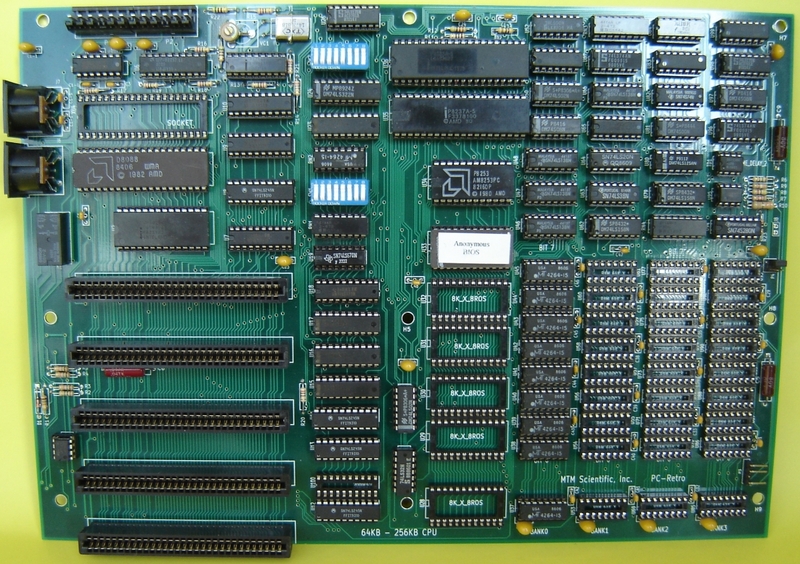 The PC-RETRO motherboard will hold up to 4 banks of memory, for a total of 256 KB. Since the PC-Retro Kit is supplied with one full bank already, you can add up to 3 more banks. Note: It is not necessary to add more memory for the PC-RETRO to work. The PC-Retro kit will boot and function with the memory included with the kit, so adding more memory with this 9 piece chipset is strictly optional! 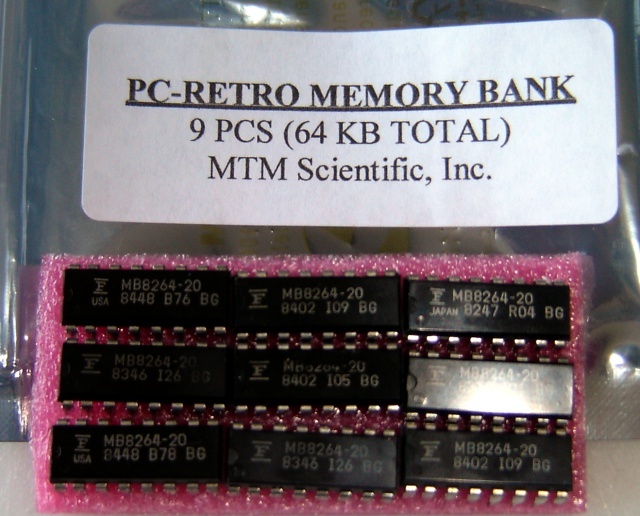 PC-RETRO MEMORY BANK OPTION (Catalog #MEMORY)...$15.00 each, Free Worldwide Shipping. The PC-RETRO DIAGNOSTIC ROM ADAPTER (Catalog #DIAGROM) is an optional diagnostic tool that PC-Retro Kit Builders and IBM 5150 PC Enthusiasts may find especially useful. 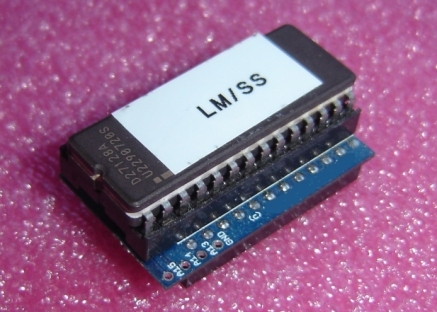 This adapter allows you to replace the BIOS ROM IC at location U33 with a pre-programmed IC which will execute a detailed series of functional tests on your Motherboard. This setup is great for troubleshooting either the PC-Retro or the original IBM PC. 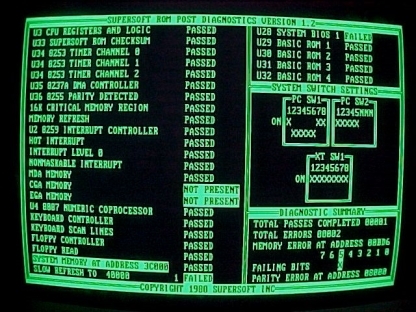 The software program is the vintage Landmark/SuperSoft Diagnostic as described here: Program Details. Using an IC adapter allows use of the more common 27XXX series ROM chips, as described here: Adapter Details. Note that this program requires either an MDA, Hercules or CGA video adapter to provide video output. The program also has audio output to relay some basic information without a display. PC-RETRO DIAGNOSTIC ROM ADAPTER (Catalog #DIAGROM)...$17.50 each, Free Worldwide Shipping. The PC-RETRO PCB (Catalog #PC-PCB) is an option to purchase only the bare PCB (Printed Circuit Board). We are offering the bare PCB after having received numerous requests from hobbyists. This PCB is useful for building-out different parts of the PC circuit at your own pace using the circuit diagrams provided in the IBM 5150 Technical Reference Manual. You will receive only the bare board via 1st Class Mail. Please Note: This is an item for advanced electronic hobbyists! 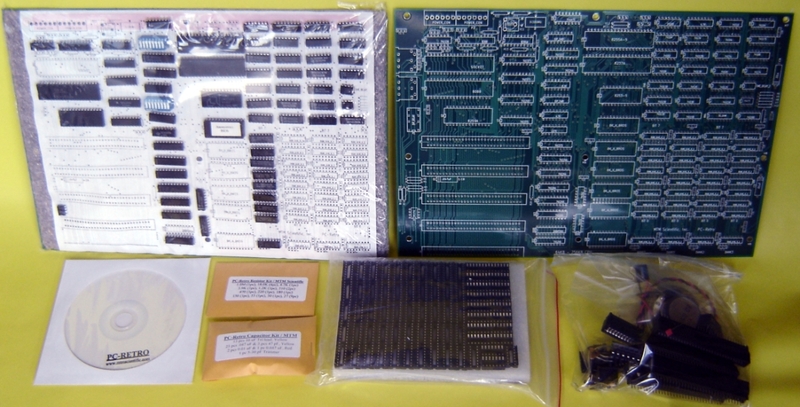 PC-RETRO PCB INTERNATIONAL (Catalog #PCB-INT)...$49.50 each, with International Shipping. We keep ordering simple! Prompt, courteous 30 day refund policy on kits that have not been started. There are no shipping delays for Personal Checks or Money Orders. We ship promptly by Priority Mail. International Customers: The PC-Retro Kit is available for $235.50 shipped to any destination worldwide by postal mail. We apologize for the additional expense, but it is not in our control. The PC-Retro Kit for international destinations can be ordered for $235.50 using the Paypal link below (Catalog #PC-INT is for International Delivery). Please Note: Tracking information is not available for postal mail packages. Delivery time to most international destinations is approximately 2 to 4 weeks. We will send a confirming email with custom declaration number when your kit is mailed.